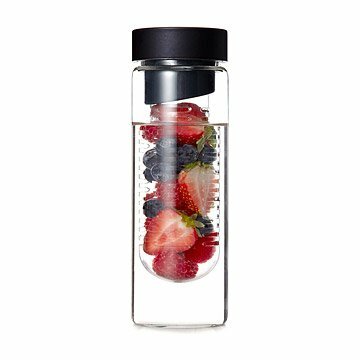 Add some pop to your water with this flavor-infusing water bottle. Would you like your water with lemon? How about strawberry, orange, blueberry, or watermelon? Anyone can be a mixologist extraordinaire with this flavor-infusing water bottle. Treat yourself to a refreshing, midday pick-me-up of lemon and mint, or a splash of summertime with strawberries and blueberries. This sleek, glass bottle also cuts the environment a break, reducing our dependence on plastic water bottles. Made in China. Click here to learn how to use your Flavor Infuser Water Bottle. Visit our blog to see the Flavor Infuser Water Bottle in action--recipe and all! Dishwasher safe. Do not freeze or microwave. Avoid using cleaners contianing chlorine or bleach. Not recommended for hot drinks. It will take 5-10 minutes (depending on the fruit/vegetable/herb) for the flavor to infuse into the water. I use this product to give my water a little kick. I already purchased this product again for a gift exchange! Well built and easy to clean. This infuser is gorgeous and sturdy. I can carry it with me and it looks great on my desk. I'm definitely drinking more water! This is just the perfect size bottle to schlepp around during my day. I create all sorts of different flavors to my water. The cap stays on tight so it doesn't leak. I LOVE it and just might buy another for a gift. I love that it is glass and has a sippy lid inside. Makes me drink more water bc it's so pretty! I bought this to get myself in the habit of drinking fruit water. It is so convenient and easy to use in the morning and I can refill the water throughout my workday! I love it so much that I ended up buying one for my mother. Delivery was very fast, and the product is amaxing. Mom infuses citrus daily in it. Is looking forward to trying berries and other fruits. We both love that it is glass and the sip top is awesome.